Berrylicious Oats – Breakfast of Champions! I had a fantastic breakfast today. I actually have pretty much this same thing Mon-Fri. I’m pretty creative eh?! 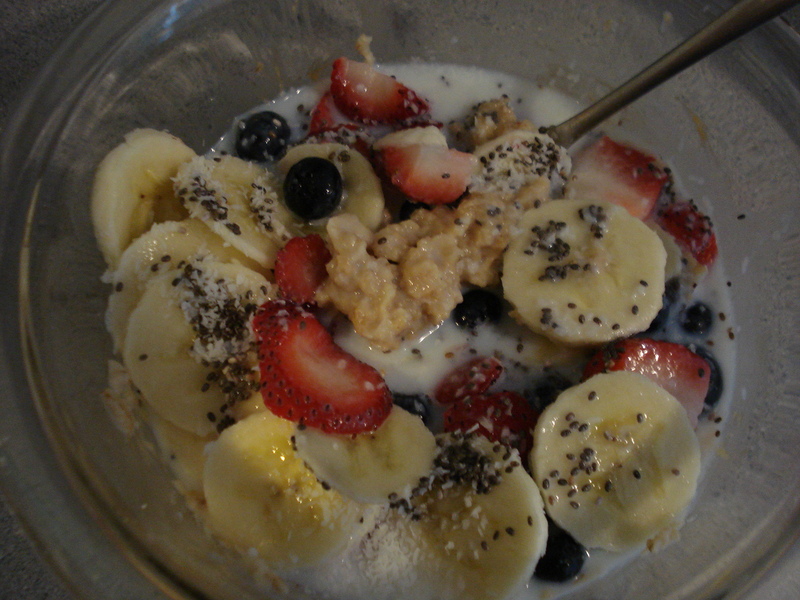 In the mix: 1/2C oats (just covered with water and microwaved for 2 minutes), 1 tsp peanut butter (unsweetened & unsalted), 1/2 a banana, 3 strawberries, a handful of blueberries, a tsp of chia seeds, a tsp of coconut and a few splashes of skim milk. Have a great day everyone! It’s gorgeous out there! Ugh. It makes me incredibly angry when those who abuse and neglect animals are not punished. I am such an animal lover that it really kills me. You have no idea how bad I’d like to find some animal rights activists and tell them where this one woman lives – the one who had the 17 dogs seized. After the humane society had taken those dogs, her property was quiet for about 2 weeks until she returned with her horse trailer filled with more. The barking that comes out of that house is insane! Police have been called, the city has been called, the humane society… and still nothing happens. So sad.